Home Memoir or Autobiography Why Do You Believe What You Believe? The answer to the question “Why Do You Believe What You Believe?” is often left to the interpretation of those who know only what you believe. A few days ago, I had a conversation with a gentleman who didn’t want to leave those interpretations to chance. He had some very strong opinions on topics that at a glance didn’t align with other positions that he held. His concern was that if someone knew one piece of information about his beliefs, they might automatically assume other beliefs. He wants the chance to explain it all for those who might be interested now and in the future. In today’s 140 character world and 30-second sound bites, it’s easy for people to know what we believe and much harder to explain why we believe it. Explanations take up more space and time than is usually afforded them. A personal statement of beliefs and values with a complete explanation can help ensure that you are not misunderstood. You might even sway some minds! If you decide to do something like this, it’s a good a idea to be thorough and include sources that have helped shaped your beliefs. 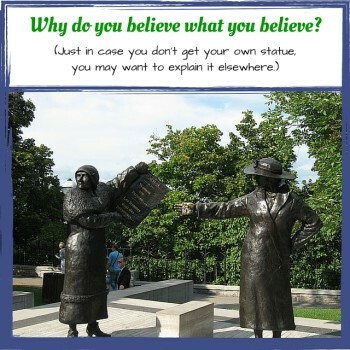 Like everything else, there are many different ways to share your answer to the “Why do you believe what you believe?” question. Here are a few ideas. A personal blog – Don’t skip over this one just because “blogging” is for bloggers. A personal blog can be set up in minutes on Blogger.com or WordPress.com and like a Facebook Group, it can be public or private by invitation only. It can be your personal place to state and explain your beliefs. If you ever decide you are finished. You can even convert it to a book. Just search Google for “convert blog to book” to find out how. Check here for more information on using Blogger and WordPress. A printed book – Typing a document and printing it out or having it professionally printed is one of the safest things you can do from a technology perspective. Although Facebook seems like it could be around forever, it probably won’t. Even if it is, you are still using “rented space”. There’s no guarantee that your Group will be there forever. That also is true if you set up a blog on Blogger or WordPress.com, however if you buy a domain (yourname.com), you do have ownership. However, when you die, someone will need to pay the bill for renewing the domain, or your blog will just fade away. A printed book can be distributed right away or tucked into a lock box for someone to find at a later time. An e-book is a great option because it doesn’t cost anything and many people read on e-readers like Kindle or on their phones and tablets. You can create a PDF file that just about anyone can read and also create a version that works on e-Readers. You can email them or put them on a flash drive to deliver or store for later. If you are printing a book, it doesn’t take much additional work to also create an e-book. Most documents can be saved as a PDF right in the software where they were created. For e-Readers, you can use a free piece of software called Calibre to convert most documents into a usable format. Have you ever thought about creating a personal beliefs statement? If so, do you have any other ideas for how you might share it? Leave us a message in the comments below. PS. Speaking of different “stuff” you might want to share with your family and friends, did you see Val’s article on AmericasFootprints.com? Hi Val, I started my blog last December and it feels good to get my word out, even if no one seems to be listening much yet 😀 I love your grahic for this post, it made me laugh! Hey Lisa. I love that you are blogging and I just read your most recent post. It’s not easy to make yourself vulnerable like that, but just like with memoir writing, sometimes the greatest value to the reader comes from your most vulnerable places. Glad you like the graphic! I was hoping I wouldn’t be the only one who thought it was funny!